Standard Chartered Marathon one of Singapore’s biggest sports event with apparently 19,000 people taking part just in the 42km distance alone for this year. Well I participated this year hoping for a nice 5 hour marathon.Apparently, it is an IAAF gold race while i do not know what that means but I think it could possibly means well organized and big participation. Just thought hitting 5 hours would be a breeze in the park. I mean after all, I came from cycling where 4 hour races are common. I was wrong;very wrong. I must say that I did not train much for the event due to a crash on my bike 3 weeks before the event and a flu spell the week before the event. I was scheduled to completed at least to hit a 30km tempo run but due to misfortune, i only hit 25km. Prior to that I had done the 21km army half marathon (recorded time 2:12 gun time 2:08 according to my g shock) and a 16km passion run (recorded time 1:37). Given my half marathon timing, completing in 5 hours means I have plenty of allowance, I mean 2:08 X2 is 4:16 assuming run at 6 minutes per km! Thus, was confident that I would get a nice time. I let myself a upper allowance of 5 hours 30 minutes. Race day, woke up at 3am to prepare for race start at 5am. Carried with me 6 packets of energy gel (1 per hour with allowance for 1 extra) and a water bottle. Met up with my cousin’s husband at city hall mrt (good work for race organizers at letting the trains run earlier though at 15 minutes allowance) We were aiming for the 4.15 hour pacer group. And there were no further hitches despite the crowd. Flag off at 5am and boom, being 200m from the start line, I quickly joined up the pacer group within 3km of race start. Felt good running at the pace for 16km. Cousin’s husband was in the group as well but he had dropped out by 14km. Reached the 21km turning point at 2:15. By then exhaustion and lack of training had set in, by 25km could not take it due to the extreme pain in the knees and walked on for another 4-5km.Cousin’s husband went on and later on told me he had punctured (no energy to run) at the 34km mark (at 4:30) Started guzzling down energy gel (took a few from water point and people along the way) and water (stopped at every water point) and walk run till 36km mark where there is the fearsome Benjamin Shears bridge (had climbed by bicycle for OCBC cycle and my god it was F***ING steep)By then even walking caused my foot to hurt and it was around the 5 hour 10 minutes mark with 5 more km to go. With up slopes comes down slope but even running down proved to be difficult and finally finished the run with a dash for the finish line at 5hours 43 minutes and close to 44minutes seconds. Felt like a loser for not accomplishing my aims. Battered and bruised and aching. Its official, running a marathon is definitely harder than riding a century imperial miles! With a bicycle at least your bums can take a break and you can just follow the peleton by drafting and saving energy. For running, it is just you, the route and the undraftable people. And as i am typing this 2 days after the events, my thighs feel fatter and my knee are still hurting, and I am still walking like I have internal injury. Though I told 1 runner/walker that I swear I am not going to do this again, upon reflection, I did not train for the event and thus had the opportunity to do better. I am going to do the event again next year and aim for a sub 5 event. And now I know how ironman athletes felt like after going through 2/3 of the course just to do this last 42km! 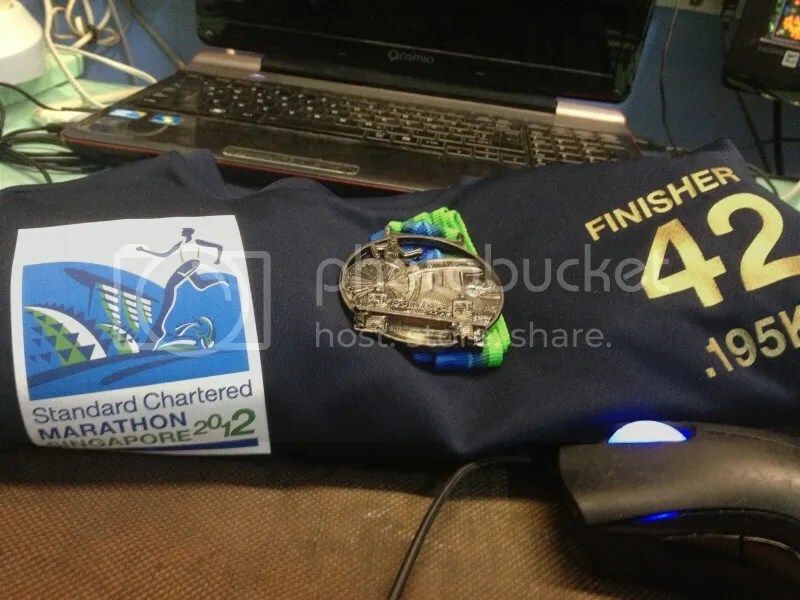 This entry was posted in Race/Ride Report and tagged marathon, pain, running, sports, stanchart 2012, suffering. Bookmark the permalink.